=convert(number, “from” , “to”) eg from miles to kms / from g to kg etc. 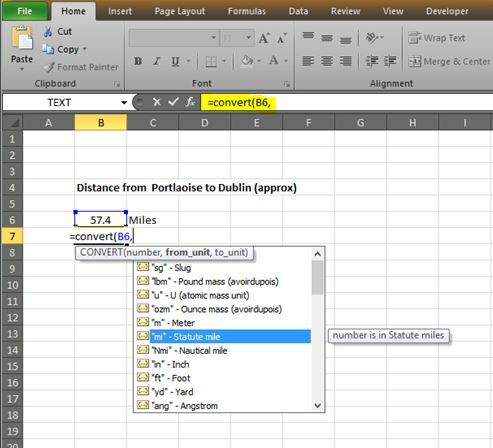 You’ll see in the above image I’ve typed =convert(B6, cell B6 is where the number I want to convert is located, a list of measurements then appears & we just select (double click) on the one we want – in this example miles. TIP: A couple of things to remember – the list of measurements is not complete. In addition to the basic units, there are also multiplier options which apply mostly to the metric measurements. For example ‘m’ is the abbreviation for metre and ‘k’ is the multiplier prefix for ‘kilo’ or x 1000 – put the two together to get ‘km’ the CONVERT abbreviation for kilometre. Also the formula will only work if there are quotation marks around the “from” and “to” units. And that’s it! A simple way to convert measurements using Excel. For a longer list of measurements which can be used click here.